For the most part, I am glad that I am an adult. Being several decades old gives me a number of advantages that I didn't have before becoming that age, like having the opportunity to go to my local movie theater and seeing R-rated movies, having the opportunity to stay up for as long as I feel like it, and spending my money on whatever luxury items fit my fancy. On the other hand, there are definitely some disadvantages to being an adult. You usually have to have a good paying job if you want to significantly maintain your lifestyle, you have to go through the stress and brainwork every year when it comes to tax time, and most adults have to frequently do maintenance on a romantic relationship that they have. Yes, there are certainly negative things to being an adult. Sometimes these things get me down enough that I think back on my much younger years, when I wasn't an adult and I had advantages back then that I don't have now. For one thing, when I was a kid, I didn't have to have a job. I was able to rely on my parents for a steady supply of food and shelter. My schedule back then allowed me a lot more leisure time to do whatever form of play that I wanted to do at the time. But there were certainly a number of disadvantages to being a kid. For one thing, I wasn't able to go to my local theater to watch any R-rated movies. And while I didn't have to go to work, I certainly had to go to school five days a week. Not only did I have to go to school, I often had to bring home work assigned to me during my classes and get it completed at home, when I would have much rather indulged in leisure activities. While I am speaking about school, I want to mention another thing about it that during my childhood gave me problems - a problem that many of us personally faced in school while we were children. And that problem is bullies. Yes, there are certainly adult bullies that can be encountered when we are also adults, though fortunately they are kind of a rarity. But when it comes to childhood, it seems that among our peers are a whole bunch of nasty and cruel-minded children whose sole aim often seems to be to make our lives a kind of living hell. Why is this? Why are there so many kids and teenagers who like to torment other kids and teenagers? Well, I remember once not too long ago something that someone told me about youths. He told me that young people's thinking processes in their brains grow along with the rest of their bodies when they are young, and while their thinking processes are growing, they have thought patterns much different than the ones that eventually form in their minds once they are adults. So while their thinking processes are not mature, they do activities that they would never think of doing when they are adults - one activity being bullying. That's certainly a plausible explanation, though it doesn't explain why some kids become bullies while others don't. But whatever the cause or causes may be that result in kids becoming bullies, there's no denying that the problem exists - and it can be painful at times for the victims of these bullies. I know this all too well, and I have to say that even though many years have passed since it personally happened to me, it's still tough for me to talk or even think about it. I have to make a confession before I go any further with this review. Way back when I was a teenager, I wasn't much into the youth-oriented comedies and dramas that were then coming out of Hollywood. I remember my mother bringing Ferris Bueller's Day Off home from the video store, and thinking while watching it, "Boy, this Ferris guy is an arrogant jerk!" I generally preferred youth comedies and dramas that had a realistic tone, and today as an adult I feel the same. And that's one reason why I liked My Bodyguard as much as I did when I first saw it as a teenager. It's not a perfect movie (more on that later), but its efforts to be realistic will make viewers feel they are being treated with respect while they are nodding and thinking, "Yes, that's how life is." When Moody starts bullying Clifford, it with a simple insult of his last name. Bullying usually does start with small stuff like that. And Clifford's immediate instinct is to insult Moody back. Though Clifford does not realize at the time that his reaction to Moody sets off a spark, and quickly it is too late for him to stop Moody's rampage of terror. All of this too has a realistic feeling to it. As mentioned in the plot synopsis in the previous paragraph, Clifford is smart enough to try some actions to stop the bullying, and these actions feel realistic as well. Though Clifford's eventual plan to hire a bodyguard is an unusual action, what happens beforehand to help him get the idea is portrayed in a way that you can believe it. It could very well happen in real life. Before I go any further, I want to mention that the movie's attempts at making things realistic are not always dead serious. Sprinkled at various points is a good amount of humor. Though some of it is yuk-yuk humor, mostly it's the kind of humor that makes sure to also portray various situations with enough skill that most viewers will be able to personally identify with much of what's happening. You'll think back to your days in high school, remember stuff like this happening in your life, and lightly chuckle to yourself, "Yes, that's how life is." When Clifford gets Linderman to be his bodyguard, Clifford's first action - revenge against Moody - is exactly what any kid in his position would do, and you can't help but find it funny. Earlier in the movie, when there is a darker vignette like whenever Moody is bullying Clifford, despite the obvious dark edge you'll find yourself quietly smiling despite yourself at Clifford struggling against great odds. That's just what I went through, I thought to myself, and the identification made me grin despite a part of me inside wincing a little while recalling my past. Actually, while the realistic tone of My Bodyguard certainly makes the bullying parts of the movie very palatable, the best thing that this tone does for the movie is with the subplot about the building friendship between Clifford and Linderman. One of the ways the filmmakers make this friendship work is with the effective casting of actors Makepeace and Baldwin in these two roles. For starters, unlike most youth-oriented movies, they are not 20ish adults playing teenagers - they are real teenagers playing teenagers. That fact may also explain in part why the performances of the two actors are very convincing. Makepeace with his words and actions make you believe that his character is mostly an ordinary youth, but eventually finds (in a realistic way) he has a lot more smarts and inner strengths that he previously thought he had. Baldwin has a more challenging role, playing a figure who initially comes across as very scary, but eventually reveals he has a good amount of inner pain and doubt about himself. Baldwin has to go back and forth between these two extremes several times, but always makes the transition seem natural and believable. Each character is interesting on his own, so when these two opposites are paired together, some real chemistry and character development is seen. The evolving friendship, one that eventually has to battle some real problems, is one that feels believable at every turn. While the characters of Clifford and Linderman are the heart of the movie, there is also some interest in the scenes with the bully Moody. 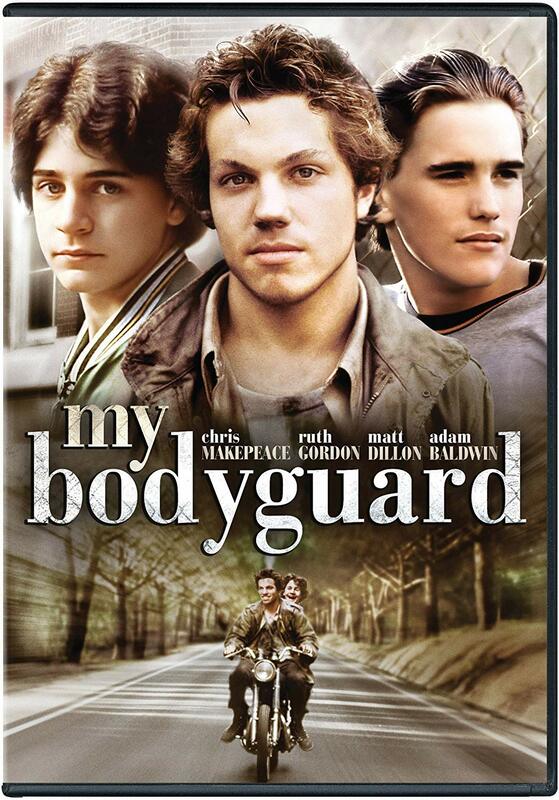 Actor Matt Dillon, also a real teenager at the time of filming, takes his well written part and finds the right note to play it. His character comes across as very interesting. While we in the audience of course hate this grinning overconfident and bullying lout and wish that he gets his comeuppance, at the same time we get the impression that he's not a total creep. Moody may be a real bully that needs to be stopped, but you get the sense that with some serious discipline and punishment, he could be reformed in his ways and become a responsible member of society. Another youth actor in My Bodyguard that I feel deserves attention is Paul Quandt as classmate Carson, who in his only acting job to date is funny enough to steal the show in all of his scenes. By now, you may be wondering if there are any adult characters in the cast worth mention. Well, there's Martin Mull (Flicks) who plays Clifford's father, and there is Ruth Gordon (Maxie) who plays Clifford's grandmother. But while Mull's character (barely) has a purpose in the movie, Gordon's simply doesn't. She's involved in a subplot about her horny character coming on to various men in the hotel she lives in, a subplot that goes nowhere and serves no purpose except to pad out the running time. That is not the only script-related problem to be found in the movie. Late in the movie, further details about a tragic incident the Linderman character had in his past come out, and the revelation of these details threaten both Linderman and the friendship he has with Clifford. But these details on the tragedy, and the tragedy itself, are subsequently dropped and are never brought up or dealt with in any real way again. The script's real misstep, however, is with the climax of the movie. I won't say exactly what happens in the climax, but it feels like screenwriter Alan Ormsby (who earlier wrote Deranged) simply at this point gave up trying to write a realistic and intelligent look at youth lives, and instead decided to throw some bloody meat to the wolves in the audience. I admit I am human and not perfect, and that the bloodthirsty (and formerly bullied) part of me did get some perverse pleasure out of the somewhat savage portion of the movie. But the larger part of me that was enjoying up to this point a smart and sensitive movie saw that the tone of this climax didn't fit at all with the rest of the movie. I can imagine that many youths being bullied who will watch the movie will object as well, since they can't imagine themselves doing what Clifford does in this climax. Aside from this climax, the movie does do things well enough that I'm giving it a recommendation. But if you see it with your kids, you might want to have a discussion afterwards with them about that climax and what Clifford might have done instead.